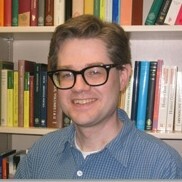 Simon Peter Burris, Senior Lecturer in the Department of Classics, joined the department in the Fall of 2005. His primary teaching area is in the Greek language and literature. Previously he served as Visiting Assistant Professor at Luther College in Decorah, Iowa, where he taught Classics and Paideia, Luther’s influential core curriculum. Dr. Burris earned his Ph.D. in Classical Literature and Philology from Cornell University (2004) with a dissertation titled, “Refrains in Ancient Greek Poetry.” He holds his B.A. in Classics from the University of Texas at Austin (1992). Dr. Burris’s primary area of research is Greek lyric poetry, particularly the ideology of victory found in the epinician odes of Pindar. He has presented numerous papers on Pindar, Homer, and other classical authors at various conferences including those of the American Philological Association. In coordination with the Green Scholars Initiative, Dr. Burris also works on ancient Greek literary papyri. His current projects include the editing and interpretation of new fragments of archaic Greek poetry. Dr. Burris currently serves as President of the Texas Classical Association.